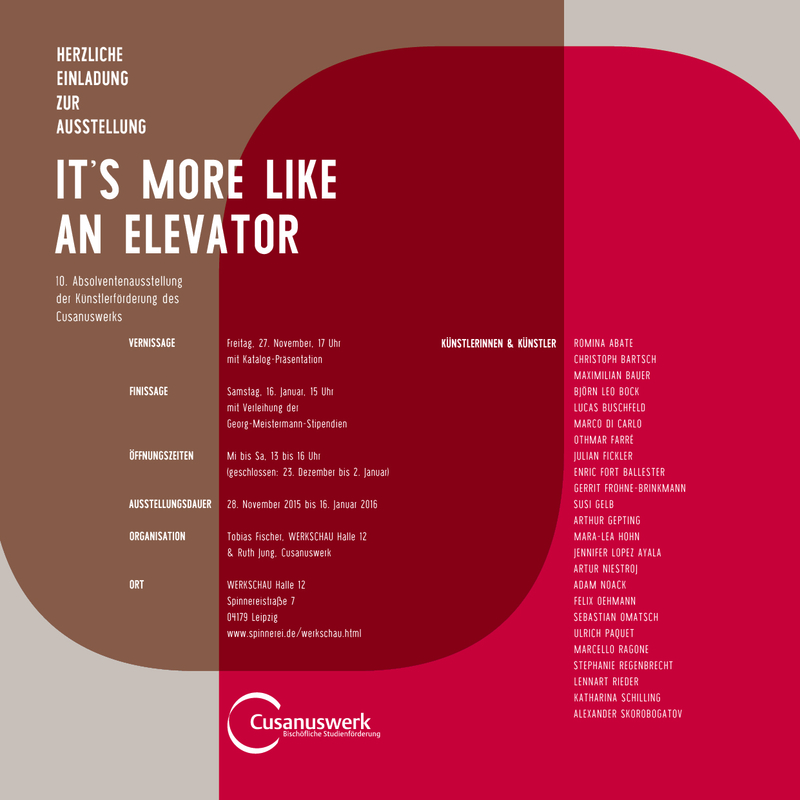 "IT’S MORE LIKE AN ELEVATOR"
The exhibition “Europe / Eutopia” is part of the curatorial project Mittel-Europa (www.mitteleuropa.me). Focusing on the three pillars of the 21st century: translation, migration and hybridization, M-E is an ongoing curatorial platform which puts the concept of narration at the heart of the material creation. 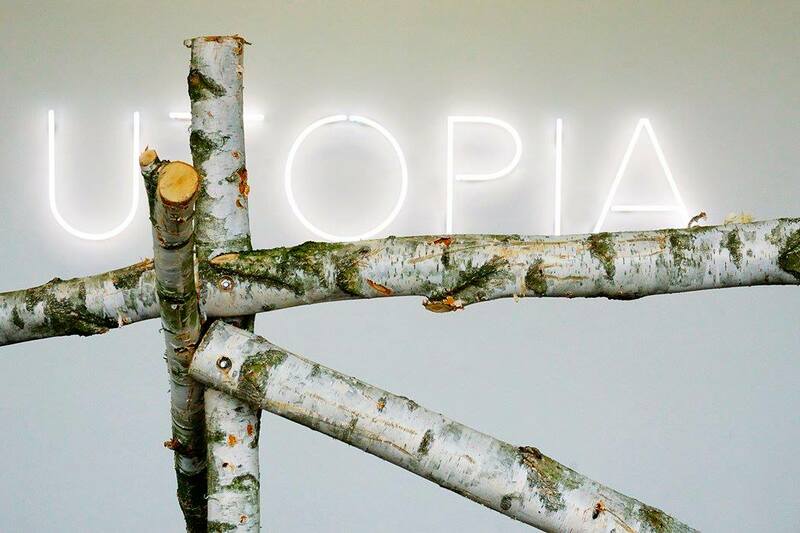 The Mittel-Europa project develops fragmented narratives and immersive forms of exhibitions, where theory connects with different languages mediums, from sculpture to sound environments, to photography, to installation and performance. On request - overnight stay in the exhibition space. 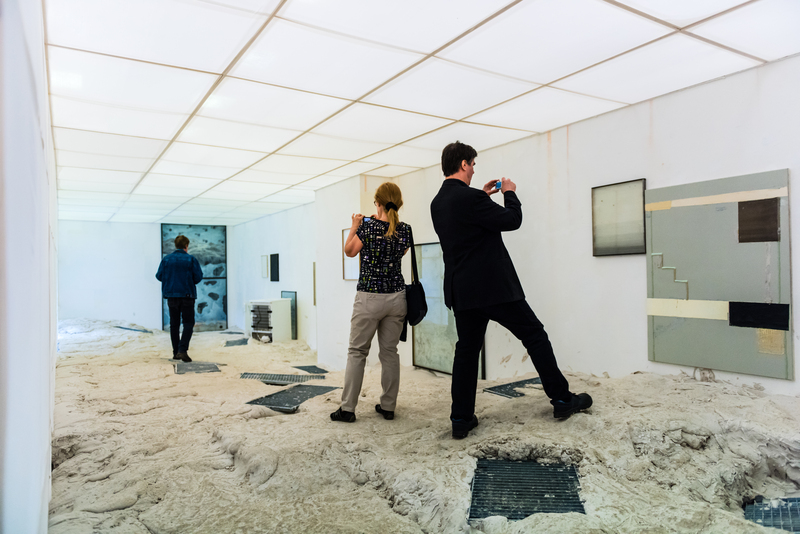 The SPINNEREI cordially invites you to the Autumn Gallery Tour. On September 12 and 13, 2015 at 11 am all of the galleries and exhibition spaces open up new exhibitions of various art positions. 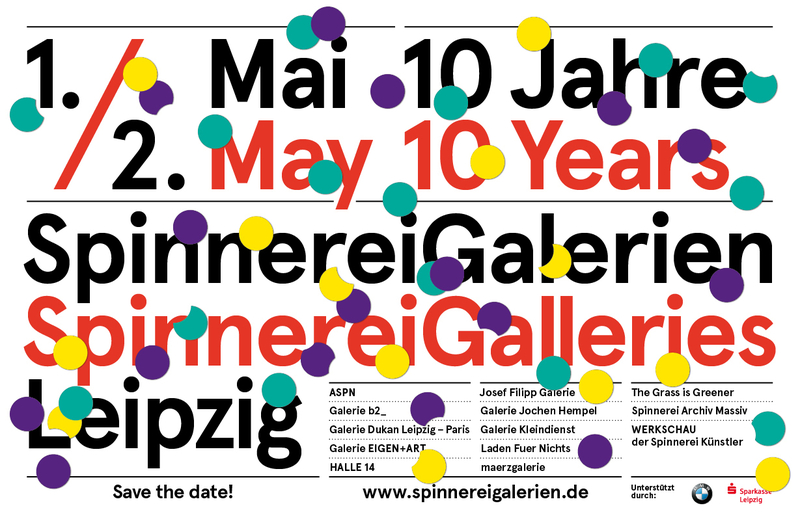 Due to extended opening hours during the gallery tour you have the opportunity to explore exciting new exhibitions and experience the SPINNEREI in action on Saturday from 11 am to 8 pm and Sunday from 11 am to 5 pm. We would cordially like to invite you to our Summer Show taking place at LIA-Leipzig International Art Programme/ Spinnerei Leipzig. Awardees from the New York Academy of Art: Marcelo Daldoce, Valérie Gilbert, Adam Lupton, Charlotte Segall as well as David- Ashley Kerr (Australia), Line Gulsett (Norway), Daniel B. Horowitz (USA) und Elena Vonbrota (Great Britain/Italy) will show their works made during their residency stay. After the guided tour we will serve cold cocktails. “History reloaded” is an art narration by CHTO. Since his 2002 book L’Adieu au XXe siècle, artist-writer CHTO (Camille de Toledo) has been looking to understand the foundations of the delayed historical order we live in. How do we embody these political, economical, and philosophical times in which each of us must come up against the insurmountable horizon of the end of History? How do we represent an endless history, a history re-begun? In 2008, CHTO began to write an opera; the End of History and the return of violence at the dawn of the 21st century were its central themes. After five years of work, The Fall of Fukuyama, an opera-video for four soloists, chorus, and orchestraco-written with the composer G. Hetzel, was premiered at the Salle Pleyel in Paris. This was for CHTO the birth of a “totem of endings”: an avatar of the American political scientist Francis Fukuyama was created with J. Olender, T. Jorion and A. Fradier. Conceived for the opera, this imperfect, pixelated avatar made with an old computer game software became a migrant doll in CHTO’s work. 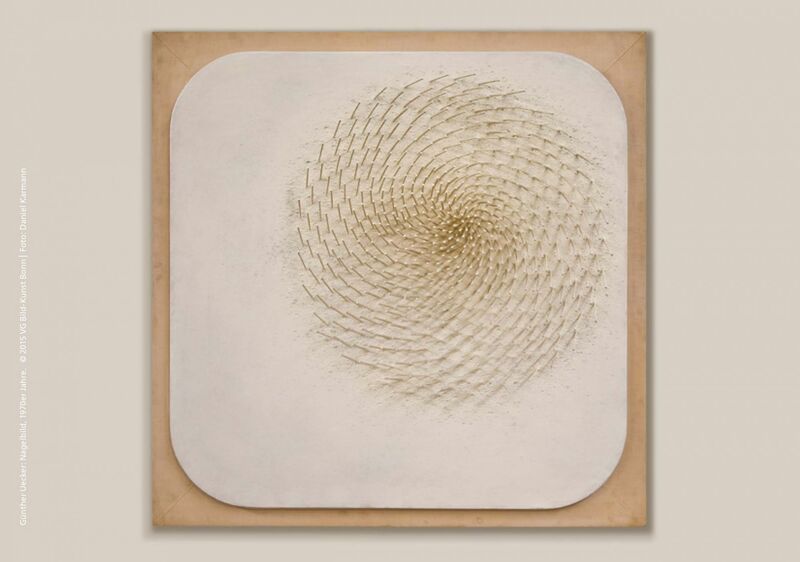 It moves from medium to medium – video to sculpture to installation. It is a totem through which CHTO stages, continuously, “the death of a spirit, of an obsession.” This figure became for him the sign of the passing from one century to the next, between the century of last men, constantly producing the science of apocalypse, endings, impossibilities – and a new affirmation of possible futures.